Peter Smith, accompanied by psychology expert, Ginny Smith (BBC 5 Live’s ‘Naked Scientists’) led a brilliant session that saw some impromptu behavioural experiments, lively discussions and, for a lot of audience members, revealing truths about the way their minds work. Exploring the latest thinking in cognitive and behavioural science, the session set out to explain how these recent findings might impact upon long-held negotiation techniques. The session kicked off with a look at the history of negotiation and Peter argued that it was present with the earliest of humans – “I’ll swap this axe head I made for some of your deer meat”. This, Peter argued, would have marked a key moment in our history as individuals realised the benefit of entering into contracts and attempting to reach mutually beneficial agreements. The traditional view of negotiation in business holds that if you are able to manipulate the shift in power between yourself and your opponent in your favour, then you can come out on top. This involves tactics such as having your opponent sit in an uncomfortably hot waiting room and then placing them in a low chair with the sun in the eyes. However, whilst these are the quintessential hallmarks of traditional negotiation, they are based on very basic psychology and whilst some elements may hold true, our understanding of human behaviour has come a long way since then. As a result, so too should our approaches to negotiation. There are two key dimensions to negotiation: preparation and execution. As part of your preparation, Peter highlighted the absolute importance of having your BATNA (Best Alternative To a Negotiated Agreement). This means knowing what your utmost line in the sand is – a powerful piece of information that keeps you in control of your decisions during a negotiation and which reassuringly, allows you the peace of mind in knowing that you can walk away from negotiations if things are not going your way. Of course, your BATNA can also play to your advantage if it is stronger than that of your opponents. However, by that same logic, a weak BATNA could undermine your negotiation power. In the latter half of the presentation, Ginny took to the floor and devolved a wealth of psychology knowledge that had us on the edge of our seats keen to learn more. It’s somewhat unnerving to realise just how little you know of your inner mind’s workings and how easily they can be manipulated. What came out of this part of the session was the prevalence that heuristics takes in our thought processes. Our brains consume about 20% of our daily caloric intake and to that end, attempt to keep their energy consumption to a minimum by creating neural short-cuts that save on processing power. As a result, we are susceptible to being persuaded (through priming and anchoring) by a plethora of stimuli (such as confusing positive feelings of an individual with the warm sensation from holding their coffee cup for them). There were several key takeaways from the session. Chief amongst those for me was the need to be aware of our susceptibility to priming, anchoring and framing. In knowing ourselves, we can keep a check on our thought processes. Another good point raised from the session was that framing can make a difference between a proposal being accepted or rejected. Try phrasing offers and points in different ways, place a positive slant on them and see if that helps to turn the tide in your favour. If you’re keen to learn more on the latest thinking in behavioural science, we recommend reaching for Dr Daniel Kahneman’s 2012 book, Thinking, Fast and Slow. The session’s content was based on his research and the book is very accessible. 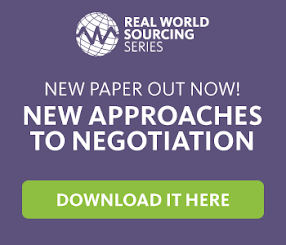 If you’d like to learn more about the Real World Sourcing Series and book tickets for our events later in the year, please head to http://explore.bravosolution.com/realworldsourcing.